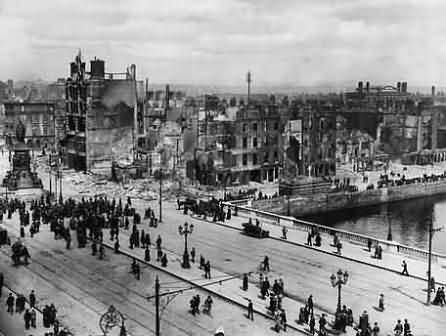 Historic 1916 Dublin city center photos in the aftermath of the Easter Rising. The burnt out shell of the Dublin GPO - General Post Office on Sackville Street [now O'Connell Street] & ruins of the Metropole Hotel in the aftermath of the 1916 Easter uprising, Nelson's Pillar is visible to the right. Many city centre buildings were destroyed by shelling from the British gunboat Helga on the Liffey & field guns at Trinity Colege. Central Dublin streets & buildings after 1916 uprising. 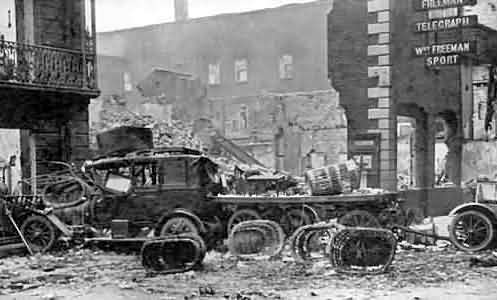 The remains of The Freemans Journal & Evening Telegraph building & street barricade, central Dublin 1916. 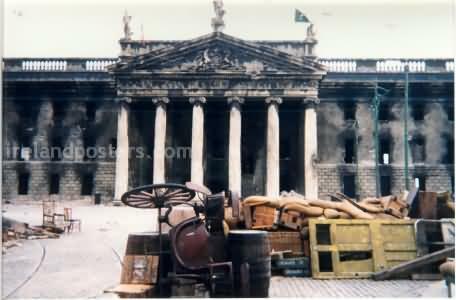 Photographs of the set constructed for Michael Collins movie on location in Dublin. The images below are Sackville Street building fronts, with the General Post Office building showing damage sustained during the 1916 Irish Easter Rising, during which the building came under British artillery & gunboat fire after being taken over as a Headquarters by the insurgents. Replica 1916 GPO building on Michael Collins movie set. Film extras & replica building fronts on Michael Collins film set. Find out more about the 1916 Easter Rising history & personalities - at the National Library of Ireland. British Pathe newsreel footage of Dublin 1916, shelling & fire damage to Liberty Hall & Sackville street. Read eye-witness accounts of the 1916 uprising & view images from Irish military history. Watch the Irish film short Chrono perambulator & view location set photographs. View a photo-guide of historic monuments & famous Dublin Ireland landmarks, includes history details. Irish photo gallery & Ireland posters - main contents.